AUD 15,248 Excl. Duties / Taxes. This Radiant diamond is 2.01 carat in weight, and comes with Excellent polish and Excellent symmetry, as verified from an independent gemological laboratory. 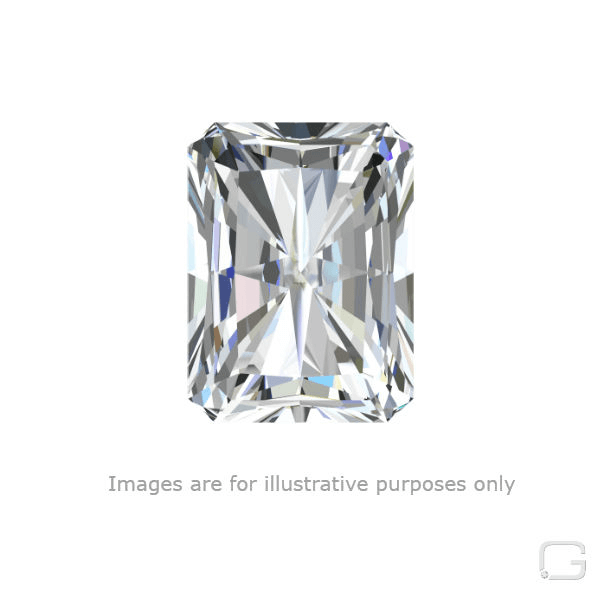 The diamond is graded J in colour, and has a clarity grade of VS1. The diamond's GIA grading report number is 5181231572, which will detail further its specifications and measurements, and will also come with the purchase of the stone. AUD 16,382 Excl. Duties / Taxes. This Radiant diamond is 1.36 carat in weight, and comes with Excellent polish and Excellent symmetry, as verified from an independent gemological laboratory. The diamond is graded E in colour, and has a clarity grade of IF. The diamond's GIA grading report number is 6204018903, which will detail further its specifications and measurements, and will also come with the purchase of the stone. AUD 5,708 Excl. Duties / Taxes. This Radiant diamond is 1 carat in weight, and comes with Very Good polish and Excellent symmetry, as verified from an independent gemological laboratory. The diamond is graded E in colour, and has a clarity grade of SI1. The diamond's HRD grading report number is 11009989013, which will detail further its specifications and measurements, and will also come with the purchase of the stone. AUD 51,983 Excl. Duties / Taxes. This Radiant diamond is 3.01 carat in weight, and comes with Excellent polish and Excellent symmetry, as verified from an independent gemological laboratory. The diamond is graded H in colour, and has a clarity grade of VS1. The diamond's GIA grading report number is 2175913714, which will detail further its specifications and measurements, and will also come with the purchase of the stone. This Radiant diamond is 0.71 carat in weight, and comes with Excellent polish and Excellent symmetry, as verified from an independent gemological laboratory. The diamond is graded E in colour, and has a clarity grade of SI1. The diamond's GIA grading report number is 6305166436, which will detail further its specifications and measurements, and will also come with the purchase of the stone. AUD 58,392 Excl. Duties / Taxes. This Radiant diamond is 3.01 carat in weight, and comes with Excellent polish and Excellent symmetry, as verified from an independent gemological laboratory. The diamond is graded F in colour, and has a clarity grade of VS2. The diamond's GIA grading report number is 1179639981, which will detail further its specifications and measurements, and will also come with the purchase of the stone. AUD 3,829 Excl. Duties / Taxes. This Radiant diamond is 1.02 carat in weight, and comes with Excellent polish and Excellent symmetry, as verified from an independent gemological laboratory. The diamond is graded I in colour, and has a clarity grade of SI2. The diamond's GIA grading report number is 1297831208, which will detail further its specifications and measurements, and will also come with the purchase of the stone. AUD 23,695 Excl. Duties / Taxes. This Radiant diamond is 1.7 carat in weight, and comes with Excellent polish and Excellent symmetry, as verified from an independent gemological laboratory. The diamond is graded E in colour, and has a clarity grade of VVS2. The diamond's GIA grading report number is 2195772538, which will detail further its specifications and measurements, and will also come with the purchase of the stone. AUD 12,251 Excl. Duties / Taxes. This Radiant diamond is 2.06 carat in weight, and comes with Excellent polish and Excellent symmetry, as verified from an independent gemological laboratory. The diamond is graded K in colour, and has a clarity grade of VS2. The diamond's GIA grading report number is 1279802721, which will detail further its specifications and measurements, and will also come with the purchase of the stone. AUD 3,519 Excl. Duties / Taxes. This Radiant diamond is 0.7 carat in weight, and comes with Excellent polish and Excellent symmetry, as verified from an independent gemological laboratory. The diamond is graded D in colour, and has a clarity grade of VS2. The diamond's GIA grading report number is 1192109212, which will detail further its specifications and measurements, and will also come with the purchase of the stone. AUD 4,532 Excl. Duties / Taxes.